With dental implant restorations from Pomerado Cosmetic Dentistry, you can replace missing teeth with permanent results. Dental implants are strong titanium posts placed under the gum and anchored to the jawbone in the area of the missing teeth. Once the implants fuse to the bone, they can ultimately serve as artificial tooth roots, along with custom dental crowns secured to the posts to create beautifully restored teeth. Unlike dentures, dental implants are designed to become a part of your mouth and mimic your natural teeth. They do not move or slip along the gums, and they are custom-designed for the most precise fit. Implants do not have to attach to the other teeth like permanent bridges. Dental implants can not only improve chewing and speaking, but they can also look and feel so much like natural teeth you may not be able to tell the difference. The best way to determine whether you are an ideal candidate for dental implants is to schedule a consultation. Our dentist will conduct a thorough oral examination of your teeth, gums, and jaw, and talk with you about the best options for your needs. If you are not a candidate for dental implants, we can recommend advanced alternatives that can address your concerns. While it may seem like a single missing tooth is ultimately not a big deal (particularly if it is in a less visible area of the mouth), the fact is that just one missing tooth can contribute to bone deterioration, difficulty speaking and chewing, and other oral health concerns. A single tooth dental implant can address these issues and restore both function and appearance. Dental implants can be utilized for the replacement of multiple missing teeth. Whether you are experiencing several missing teeth in specific areas of the mouth, or if you are missing entire rows of teeth, a dental implant can be placed for each tooth in order to create a comprehensive aesthetic and functional restoration. Implant-supported dentures can sometimes be a viable alternative for patients who need to replace multiple missing teeth. The procedure utilizes an implant or implants to provide a more stable foundation for a set of dentures or a fixed bridge. An implant-supported denture significantly reduces the potential that the denture will move or slip along the gums. It also eliminates the need for messy pastes and adhesives. What Does the Dental Implants Procedure Involve? 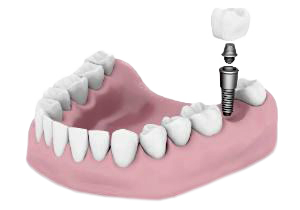 The first part of the dental implant procedure involves a thorough oral evaluation from one of our experienced dentists in Poway. For dental implants, patients must have adequate jawbone density in order to qualify for the procedure, as the implant must be anchored to a strong support structure. For patients who may not qualify for dental implants, there are a variety of effective alternatives that our dentist can recommend. Once it is determined that you are a candidate for dental implants, you will then be referred to an oral surgeon or a periodontist for placement of the dental implant. They will use advanced CAT-scan technology to create a detailed view of the anatomy of your mouth and the position of your teeth. This technology makes it possible for the implant to be very precisely guided into place for the most comfortable and accurate results. The titanium dental implant post will be delicately placed in the targeted area and securely anchored to the jawbone. Over a period of a few months after the implant has been placed, the post will fuse to the bone, mimicking a natural tooth root. Once the post has adequately fused to the bone, the implant has now become a permanent part of your mouth, and it is ready for a permanent dental crown. Our dentist will create a customized porcelain dental crown for you with the innovative CEREC® ceramic restoration technology, which can create your porcelain crown right here at our office. This crown is meticulously designed for the most accurate and natural-looking fit and appearance, and it is color-tinted to blend well with surrounding teeth. The crown provides you with the finishing touch to your dental implant. Dental implants are typically the best options available to replace missing teeth, and can provide numerous benefits for patients who are looking for alternatives to dentures. At Pomerado Cosmetic Dentistry, we can give you effective dental implant restorations that can significantly improve the appearance of your smile and the function of your teeth. Dental implants are designed to be permanent teeth replacement solutions, and many patients experience the results of these procedures for decades. With that in mind, it is important to take proper care of your teeth and gums in order to ensure the implants’ longevity. Good oral hygiene routines along with regular check-ups and cleanings at the dentist can go a long way toward increasing the chance that your dental implants last a lifetime! Pomerado Cosmetic Dentistry utilizes only top-notch oral surgeons for implant placement, and the customized dental crowns and abutments are specially made for each patient. These factors can ensure the best possible value in ratio to the cost of dental implants. While some advertisements for other offices may claim that dental implant procedures cost well below the range here at our practice, it is important to note that, in many cases, those treatments may be offered by dentists who are not highly-trained specialists in implant surgery. Pomerado Cosmetic Dentistry is committed to using extensively trained and experienced surgeons along with high-quality materials to maximize the chances of obtaining the most favorable outcome possible. After your customized treatment plan has been developed, a member of our team here at Pomerado Cosmetic Dentistry will produce an estimate of all costs associated with your dental implant procedure and present it to you for review. Our practice accepts numerous types of payment, and we work with dental financing companies such as CareCredit®. This reputable company offers many low- to no-interest monthly payment plans for applicants who qualify. We can work with you to find the way to pay for your dental implant procedure that is most convenient to your budget. What if I don’t have adequate jawbone density to support the implant? An adequate amount of healthy bone in the jaw where the dental implant is to be placed is necessary to keep the implant secure. If you do not have adequate jawbone density, that does not necessarily mean you can never get a dental implant. Procedures such as bone grafting, which places donor bone material in the jaw in order to provide the implant with a more durable support structure, can often be performed to address this issue. Our dentist will talk more with you about the available options. A local anesthetic is often all that is necessary to minimize pain and discomfort during the dental implant procedure. Will dental implants look natural? One of the many benefits associated with dental implants is their ability to provide results that look, feel, and function like natural teeth. Our goal is to provide results that look so natural you may have trouble distinguishing the artificial tooth from your original teeth! The total length of the dental implant treatment process varies from patient to patient. Once the implant or implants have been placed, the titanium posts will need time to fuse to the jawbone. For many patients, this takes approximately 1-3 months, and possibly longer for some individuals. While the post is healing you will have a temporary replacement. It’s important to remember that the goal of a dental implant is to precisely mimic an actual tooth right down to the root, ultimately becoming a part of your mouth. While the overall treatment process takes time, for many patients it is worth the wait because the results are so extraordinary. For more information on dental implant restorations, or if you would like to schedule a consultation for these advanced missing teeth replacement options, please contact Pomerado Cosmetic Dentistry.